There are different facets in a woman’s beauty and her lips definitely play an important role to enhance it. Pink, rosy lips are a dream of every girl but not many are blessed with it. Even though you got a pretty face, having dark and dull lips will simply not compliment your face, and diminish your appearance. It will make you look sickly and depressed. Blame it on genetics or harsh lipsticks to excessive smoking, several reasons make our lips turn dark and unattractive. However, lucky for you, there are natural remedies that can help you to get rid of dark lip color. 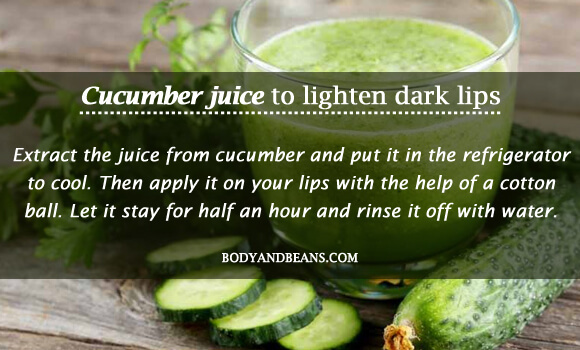 Today in this post, I will be discussing about such home remedies to lighten dark lips. If you are seriously looking to lighten dark lips and wondering about how to get the perfect pinkish glow on your lips, then here’s the post you can’t afford to miss. Pink lips are a craze among the young women. Such is their passion to get attractive lips that they are even ready to undergo surgeries to beautify them. Others go for various branded lipsticks or other expensive lip products to artificially make their lips look pinkish and brighter. However, what they fail to realize is that these commercial products conceal their dark lips only on a temporary basis, once you remove the makeup, it will be all the same again. Moreover, in few cases, the chemicals in them might harm your lips by further darkening your lip color. Therefore, if you take my advice, the best option is to try some natural remedies that helps lighten the dark lips. Today, I am happy to share what worked for me, and I am sure that these home remedies to lighten dark lips will certainly work for you. 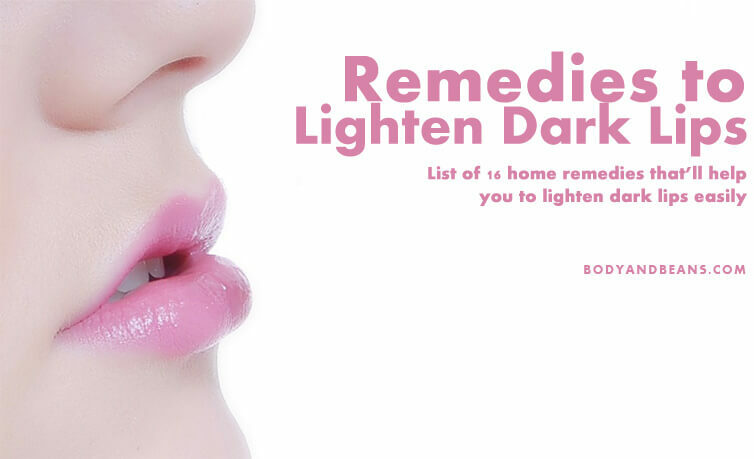 But before sharing the remedies to lighten dark lips, it’s important to understand the factors that lead to dark lips. Dark lips are very unattractive to look at and several factors lead to their darkening. While some causes like genetics is out of our control, there are many other factors like excessive smoking, applying harsh lipsticks etc that are in our hands and we can easily discard such habits to get bright glossy lips. Lips enhance the beauty and hence you must follow a proper lip care routine. And, if you are suffering from the problem of dark lips then here are the 16 top home remedies to lighten dark lips. Come let us get started. 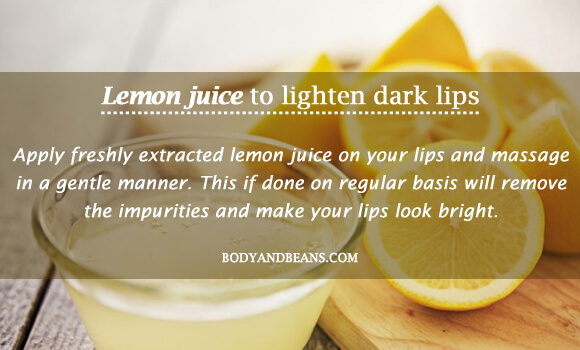 Lemon has been in use since a very long time to derive many beauty benefits with lightening your dark lips being no exception. It is natural bleach that can lighten your dark lip color. The presence of Vitamin C in it does the trick. Moreover, it exfoliates your lips by removing the dead skin cells and suntan that makes your skin look dark. To get the benefits, you need to apply freshly extracted lemon juice on your lips and massage in a gentle manner. This if done on regular basis will remove the impurities and make your lips look bright. However, avoid keeping the lemon juice for a long time as its acidic contents may harm your lips. Honey is a truly magical ingredient and it offers a number of health benefits. It can be used for moisturizing your skin. It also has potential to lighten your skin tone. Researchers say, applying honey on your lips make your lips soft, smooth and bright. It also cleanses your skin and prevents its cracking. Here you need to apply honey on your lips using a cotton ball. Rub it for 5 minutes and then let it stay overnight. Rinse with water in the morning and enjoy the smooth and moisturized pink lips. You may use the ingredients separately just the way I explained above but if after applying lemon, you feel your lips drying up too much, you may use the moisturizing honey along with it. 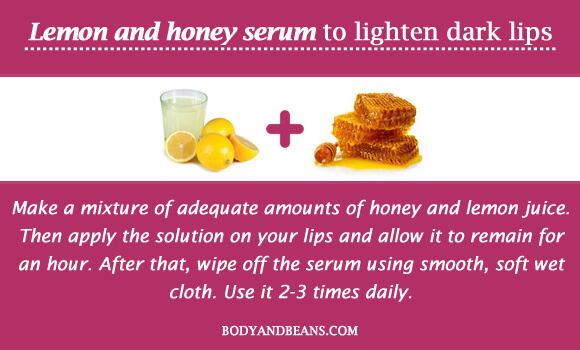 This lip serum of lemon and honey is one of the best home remedies to lighten dark lips, as it makes your lips neither too dry nor too sticky. It not just lightens the tone but also provide your lips the required nourishment to give them a pinkish appearance. At first, make a mixture of adequate amounts of honey and lemon juice. Then apply the solution on your lips and allow it to remain for an hour. After that, wipe off the serum using smooth, soft wet cloth. Use it 2-3 times daily. 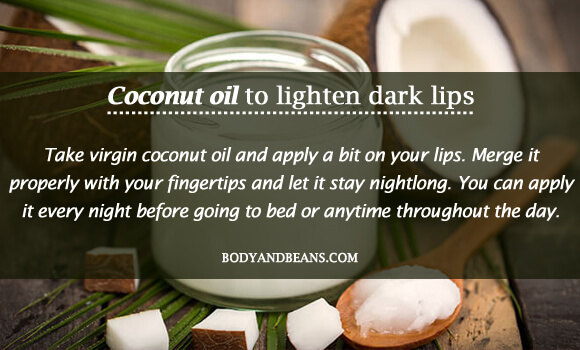 Coconut oil is another ingredient that is very good for your lips. The essential fatty acids present in it are healthy for your lips and keeps it hydrated. Coconut oil gives a replenished look to your lips and makes it pink and soft. Take virgin coconut oil and apply a bit on your lips. Merge it properly with your fingertips and let it stay nightlong. You can apply it every night before going to bed or anytime throughout the day. 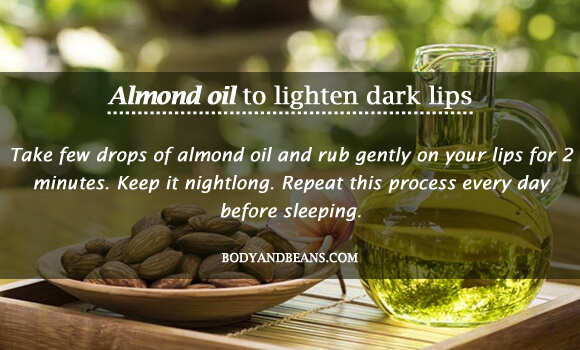 Another important remedy to lighten dark lips is applying almond oil on your lips. This is because this oil has emollient properties that nourishes your lips and soften it. Besides, the sclerosant nature reduces the discoloration of your lips as well as rejuvenates and smoothen them. Take few drops of almond oil and rub gently on your lips for 2 minutes. Keep it nightlong. Repeat this process every day before sleeping. Aloe vera has many beauty benefits with skin lightening being it’s one of the prominent characteristics. The presence of the polyphenolic compound aloesin prevents pigmentation and hence lightens your lip color. It naturally rejuvenates your lips, gives protection against the harmful UV rays, and prevents skin darkening. To get the lightening effect, you first have to extract the aloe gel from the aloe plant. 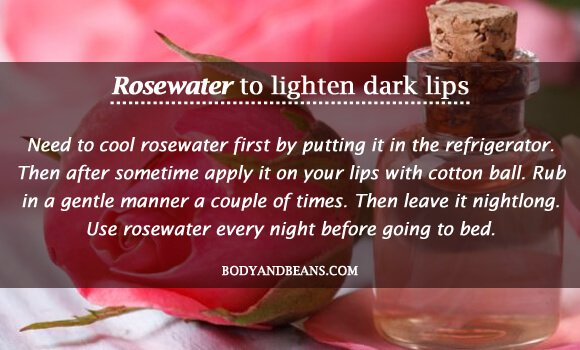 Then apply on your lips to naturally dry. After that, wash your lips with lukewarm water. We already know how important cucumber is for skin lightening. It not just helps to get rid of the dark circles but is equally efficient in making your lips look bright. The nutrients present in cucumber is extremely healthy for skin and applying its juice makes your lips soft, smooth and nourished. Take cucumber and cut it into half. Extract the juice from it and put it in the refrigerator to cool. Then apply it on your lips with the help of a cotton ball. Let it stay for half an hour and rinse it off with water. Repeat this method on a regular basis. 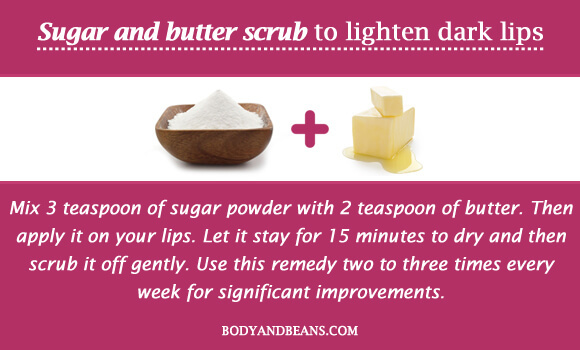 Both the ingredients sugar and butter is excellent for skin and when both of them are combined, it definitely becomes one of the best home remedies to lighten dark lips. Sugar helps to get rid of the dead skin cells whereas the butter imparts to the glossiness. In order to get the benefits, you have to mix 3 teaspoon of sugar powder with 2 teaspoon of butter. Then apply it on your lips. Let it stay for 15 minutes to dry and then scrub it off gently. Use this remedy two to three times every week for significant improvements. You may not be aware but yes the juice of beetroot is extremely efficient to lighten the color of your lips. It cleans your lips off the impurities and removes the tan. The antioxidants also make your lips look healthy. Take a beetroot and after slicing it, put in the refrigerator. Then take the slices out after few hours, extract the juice and apply on your lips. Keep it for around 20 minutes and then wash off with water. 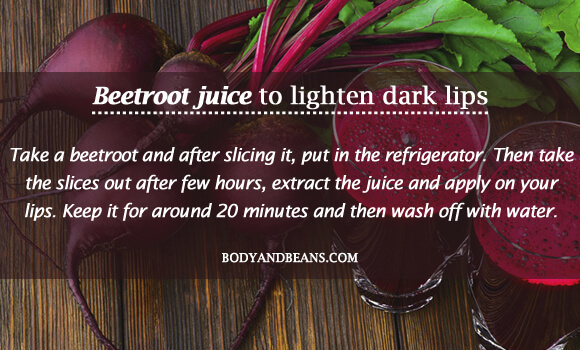 This skin friendly ingredient is great and is definitely one of the best home remedies to lighten dark lips. It stimulates the flow of blood and nourishes the skin. Moreover, it helps in the renewal of the dead cells and brightens up the look of your lips. The process is simple. Here you need to cool rosewater first by putting it in the refrigerator. Then after sometime apply it on your lips with cotton ball. Rub in a gentle manner a couple of times. Then leave it nightlong. Use rosewater every night before going to bed. Pomegranate not just tastes great but also has various skin benefits with skin lightening being one of them. It works great when used to lighten your lips. 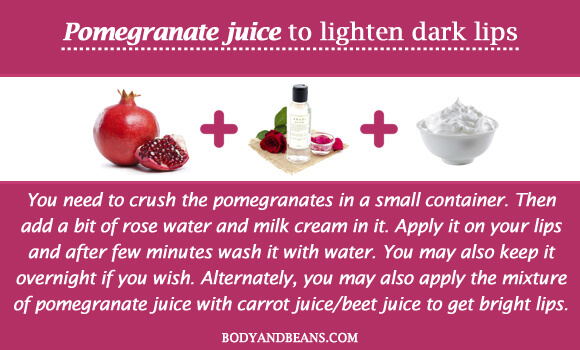 Pomegranate juice moisturizes your lips and keeps it hydrated. You need to crush the pomegranates in a small container. Then add a bit of rose water and milk cream in it. Apply it on your lips and after few minutes wash it with water. You may also keep it overnight if you wish. Alternately, you may also apply the mixture of pomegranate juice with carrot juice/beet juice to get bright lips. 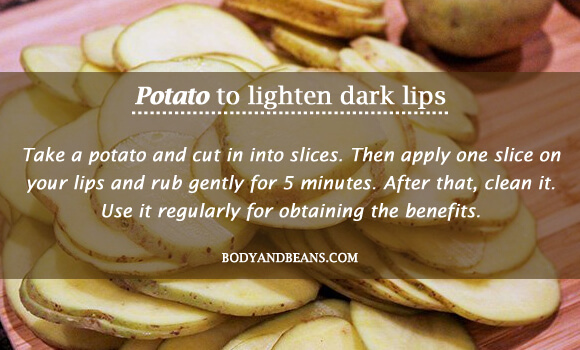 Potato is another ingredient that you may use to lighten your dark lips. The nutrients found in potato makes it natural bleach that helps you to reduce the darkness of your skin. Besides, it also moisturizes it and keeps it healthy. Take a potato and cut in into slices. Then apply one slice on your lips and rub gently for 5 minutes. After that, clean it. Use it regularly for obtaining the benefits. You may use the berries like strawberry or raspberry to lighten your lips. These berries contain the vitamins and minerals that keep your lips healthy and bright. 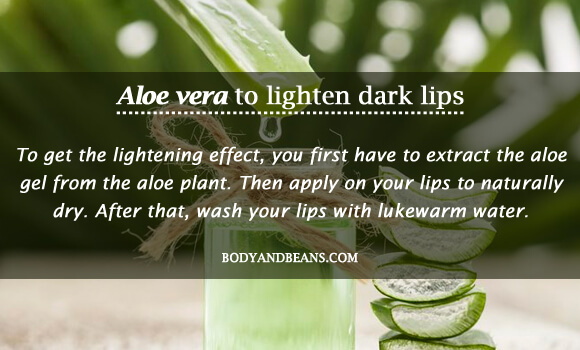 Mixing a bit of aloe vera and honey with the juice of any one of them simply enhances the good effects and is definitely one of the best home remedies to lighten dark lips. At first, you need to extract the juice from strawberry or raspberry. Then mix a bit of aloe vera gel and honey into it. Apply the mixture on your lips and let it stay for a while. After that, gently scrub it. Then wash with lukewarm water after 10 minutes. Repeat this method three times weekly to get the maximum benefits. Accumulation of the dead skin cells is a major reason behind your dark lips and with baking soda; you can easily get rid of it. 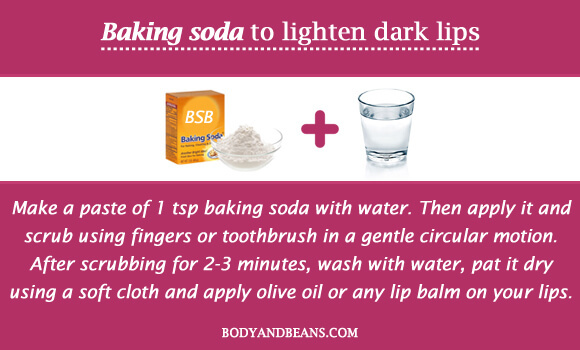 Baking soda is an exfoliator that removes dead cells and brings back the natural pinkish appearance of your lips. Here you have to make a paste of 1-teaspoon baking soda with water. Then apply it and scrub using fingers or toothbrush in a gentle circular motion. After scrubbing for 2-3 minutes, wash with water, pat it dry using a soft cloth and apply olive oil or any lip balm on your lips. Using apple cider vinegar is another great remedy to lighten dark lips. The presence of alpha hydroxyl acids removes the pigmentation and suntan giving your lips the bright pinkish appearance. 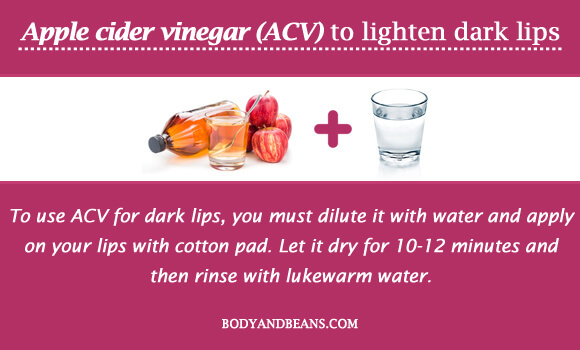 To use ACV for dark lips, you must dilute it with water and apply on your lips with cotton pad. Let it dry for 10-12 minutes and then rinse with lukewarm water. Do this one time daily. However, do not keep it overnight or for too long as the acids in it may damage your skin. Glycerin is a very easily available ingredient and is ideal for your lips. Dry lips that give the appearance of dark color can be easily prevented by applying glycerin on frequent basis. Treating your lips with glycerin makes your lips retain the moisture and look bright. 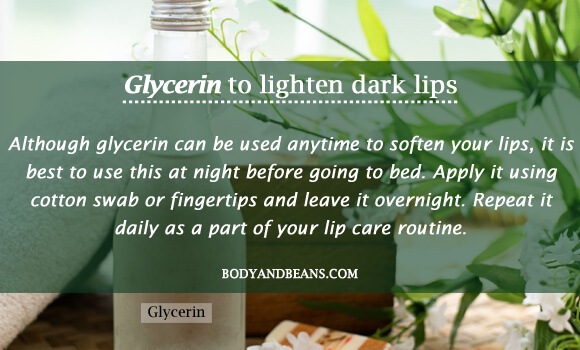 Although glycerin can be used anytime to soften your lips, it is best to use this at night before going to bed. Apply it using cotton swab or fingertips and leave it overnight. Repeat it daily as a part of your lip care routine. Apart from the above-mentioned 16 home remedies, you must also make some changes in your lifestyle to prevent darkening of your lips. Here are some of them that you must follow. The harmful rays of the sun damage your skin largely and lead to its dark color. Therefore, make sure you are carrying an umbrella and applying a lip balm with minimum SPF 15 every time you step out in the sun. Smoking is highly injurious for health and beauty. It leaves strain on your lips and darkens it too. So, if you want to maintain the natural color of your lips, it is high time you quit smoking. Control your habit of licking your lips frequently as it harms your lips a lot. Moreover, it creates a tendency to bite your lips, which further leads to its damage. Vaseline or petroleum jelly is good for lips and so you may use it to protect your lips from sun, wind and cold. Avoid using the commercial synthetic lip products as they contain chemicals that irritate your lips and makes them dry and chapped. Proper hydration is important as dehydration leads to dry, dark and chapped lips. Therefore, drink lots of water and try to keep your body hydrated. Hot beverages like coffee contain a lot of caffeine that can darken your lips. It is seen that taking 5 cups daily leads to dark lips so limit your caffeine intake as much as possible. If you drink coffee regularly, then avoid drinking more than 2twice or thrice a day. 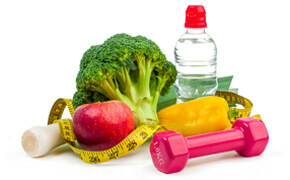 Include lots of fruits and vegetables in your daily diet. Make sure that your body gets sufficient nutrients and vitamins. Avoid harsh cosmetics at any cost. Sometimes the lipsticks that you use may contain lot of chemicals that can lead to lip discoloration. Therefore, before applying any lipstick, make sure it is a trusted brand. Removal of makeup is important. So do not forget to remove your lipstick before going to bed. You may apply a mild cream and then rub off the lipstick. After that, wash with water and face wash.
Make sure your lips remain moisturized every time. In winter, you may use a humidifier to keep the air in your rooms moist. Your daily beauty care routine must involve lips as well. Sometimes, you take care of your facial skin but miss out the lips. So make sure you do not omit it next time. In case you are under any medications that have side effect of darkening your lips, you may consult your doctor and find out any alternate remedy to avoid dark lips. Over to you: which is your goto remedy to lighten dark lips? Beautiful lips make you look prettier so I have today discussed top 16 home remedies to benefit those who are suffering from the problem of dark lips. All the ingredients used in the remedies are easily available with most of them being natural and chemical free. Most women go for the expensive products without even knowing that the natural ingredients like honey, lemon, cucumber, sugar that they use regularly in kitchen can actually solve their problem of dark lips easily. In this article, apart from mentioning the names, I have discussed the method of usage as well, so you must follow them and enjoy the benefits. There is nothing to worry as I myself have benefitted and hence can say the remedies to be safe, easy to apply and affordable. All you need is the patience to wait for the improvements and diligently maintain a proper lip care routine. However, besides trying these home remedies to lighten dark lips, do avoid the unhealthy practices like licking your lips, smoking, not removing lipstick, eating excessive oily stuffs etc to prevent dark lips. Have you tried any of these remedies to lighten dark lips? I will be happy to know about your experience. And if you know about any other remedy to lighten dark lips, then feel free to share, I will be happy to add it to the post. Until then, stay healthy and please do like and share if you find this post to be beneficial.